An intriguing doubleheader will take place on Saturday night as part of the latest Premier Boxing Champions card at the Barclays Center in Brooklyn, New York. The card, which will be broadcast by ESPN in the United States, could have an impact on both the Middleweight and Welterweight divisions. The first half of this doubleheader will feature a bout to determine interim/regular champion status in the World Boxing Association’s (WBA) Middleweight ratings as the WBA’s top Middleweight contender Daniel Jacobs will take on former WBC Jr. Middleweight world champion Sergio Mora in a bout scheduled for twelve rounds. Jacobs, who will enter the fight with a record of 29-1, with 26 Knockouts is coming off of a twelfth round stoppage over top contender Caleb Truax in April of this year. In that fight Jacobs had some difficulty for a time in the early rounds, but as the fight went on he was able to gradually break Truax down to earn a stoppage in the final round. Jacobs, a fighter with a career knockout percentage of 87% is known for his punching power and has knocked out his last nine opponents. Jacobs will face a potential difficult opponent in former WBC Jr. Middleweight world champion Sergio Mora. Mora, who will enter the fight with a record of 28-3-2, with 9 Knockouts is riding a five fight win streak entering this fight. Mora was to have challenged for the IBF Middleweight world championship in his last fight in February of this year, but ended up being a victim of bad circumstances as then champion Jermain Taylor’s legal troubles as well as an injury he suffered in training led to the cancellation of that fight and the eventual stripping of Taylor’s world championship by the International Boxing Federation (IBF). Despite the cancellation of that fight, Mora fought on and scored a twelve round split decision over Abraham Han. In what was a competitive fight Mora was able to execute his offense in spurts and was able to make an aggressive Han miss frequently with his offense. Although Mora on this fight convincingly in the eyes of this observer to win the vacated United States Boxing Association (USBA) Middleweight championship, he did suffer a knockdown in the tenth round and fought an opponent in Han who was aggressive from start to finish. The story of this fight in my eyes is a battle between Jacobs’ punching power and ability to get an opponent out of there at any point during a fight versus Mora’s ability to execute his offense in spurts, but also nullify his opponent’s offensive rhythm with his ability to be elusive and counter punch. The key to this fight in my eyes will be whether or not Mora will be able to avoid Jacobs’ power for the full twelve rounds. It is logical to assume that Mora will look to out box Jacobs and win the fight on points. The Brooklyn born and based Jacobs however, will have the support of the hometown crowd and it will be interesting to see if Mora will be able to take the crowd out of the fight as it progresses. Although Jacobs has a clear power advantage over Mora, who has only scored nine knockouts in his twenty-eight career wins, Mora is the kind of fighter that has the ability to make an opponent look bad even if Mora is not at his best. It is also important to remember that Mora has never been stopped in his career. It will be interesting to see whether Jacobs will look to score a knockout early in this fight or if he will attempt to wear down Mora and look to stop him in the later rounds. For Mora to be successful in this fight he must find a way to nullify Jacobs’ power, controlled the tempo of the fight, and win rounds convincingly. Jacobs meanwhile needs to find a way to nullify Mora’s movement and cut the ring off from the outset. This fight has the classic makings of a boxer versus a puncher. It will be interesting to see where the winner of this fight will factor in, in a talent deep Middleweight division. It may be logical to assume that the winner of this fight could find himself in position to challenge the winner of the upcoming Middleweight unification clash between undefeated WBA/IBO champion Gennady Golovkin and recently crowned IBF world champion David Lemieux, which will take place on October 17th. The second half of this doubleheader will be a twelve round Welterweight bout between undefeated WBA Jr. Welterweight world champion Danny Garcia and former two-division world champion Paul Malignaggi. Garcia, who previously held both the WBC and WBA world titles in the Jr. Welterweight division is moving up in weight officially to the 147lb. Welterweight division after fighting his previous two fights at catch weights above the 140lb. Jr. Welterweight division. Garcia, who will enter this fight with a record of 30-0, with 17 Knockouts is coming off a twelve round majority decision over former IBF Jr. Welterweight world champion Lamont Peterson in April of this year. Although Garcia is undefeated he has had some difficulty in fights in the past, most notably against top Jr. Welterweight contender Mauricio Herrera in March of last year. Many observers felt that Herrera deserved the decision. Garcia also had difficulty in his last fight against Lamont Peterson, but was able to win that fight more convincingly in this observer’s eyes based on his ability to dictate how the fight was fought and outwork Peterson over the course of the fight. Garcia is a boxer/puncher who is capable of out boxing an opponent and also capable of scoring devastating knockouts most notably in his fight against Amir Khan and in his rematch with future Hall of Famer Erik Morales. It will be interesting to see how Garcia will look as a full-fledged Welterweight. Although Garcia is still the WBA world champion in the Jr. Welterweight division as of this writing, it is logical to assume that if he is successful in his first official fight as a Welterweight that this move up in weight could be permanent. Garcia faces what could be a difficult test in the form of former two division world champion Paul Malignaggi. Malignaggi, who will enter this fight with a record of 33-6, with 7 Knockouts has fought many of the best fighters of his era. An argument can be made however, that despite being a former two division world champion, Malignaggi has come up short in some of his biggest fights against the likes of current WBC Middleweight world champion Miguel Cotto, former multi-division world champion Adrien Broner, and former Jr. Welterweight world champion Amir Khan. In his last fight, Malignaggi was stopped in four rounds by former IBF Welterweight world champion Shawn Porter in April of last year. An argument could be made that Malignaggi could be fighting for his career in this fight against Danny Garcia. Malignaggi has earned recognition in his second career for his work as a Boxing broadcaster and one may wonder what he has left to give as a fighter after a fine career. The question going into this fight in my eyes will center on what versions of the fighters show up. In one corner will stand Danny Garcia, a fighter who has at times looked spectacular, but a fighter who has also had difficulty in recent fights that has led to some criticism from fans and experts alike. Standing across the ring from Garcia will be Paul Malignaggi, a fighter who at his best can befuddle opponents with his ability to use angles, his elusiveness, and combination punching. It will be interesting however, to see what kind of effect the knockout at the hands of Shawn Porter has had on Malignaggi. In that fight Porter’s power and physical style overwhelmed Malignaggi. On that night Malignaggi simply had no answer to deal with Porter and after suffering two knockdowns in the fourth round, the fight was stopped. It will be interesting to see whether or not Garcia attempts to test Malignaggi from the outset by looking to land power punches. The key to this fight will be whether or not Malignaggi will be able to execute his offense in spurts and use his elusiveness and angles to avoid Garcia’s offense. If Garcia however, can neutralize Malignaggi’s movement and outwork Malignaggi it will be to Garcia’s advantage. Although much like Daniel Jacobs, crowd support will likely be in favor of the Brooklyn born and based Malignaggi, Malignaggi has come up short in a previous outing at the Barclays Center when he lost a very close twelve round split decision and the WBA Welterweight world championship to Adrien Broner in June 2013. It will be interesting to see if Garcia can take the crowd out of the fight early on. If Malignaggi however, can find a way to execute his offense and be effective, it would not surprise this observer to see this fight end in a close decision. 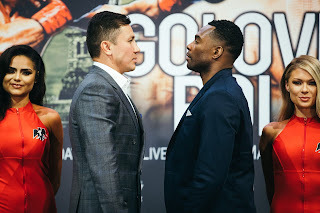 Since the Premier Boxing Champions series debuted earlier this year, the Boxing world has been treated to several well-matched competitive fights across several different networks on both broadcast and cable television. This card will likely continue that tradition as this doubleheader features two well-matched bouts with some interesting storylines. No matter the outcome of these two fights, this observer believes that it will be an entertaining evening of Boxing. Who will emerge victorious? We will find out on Saturday, August 1st.